EH shows several charts to further his “secular stagnation” claims. 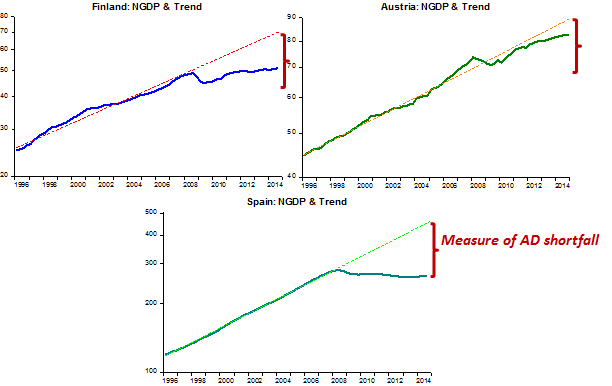 One chart he doesn´t show is a comparative chart of nominal spending (NGDP) relative to trend. I do so below and add Austria and Spain as “evidence” of the degree of the AD shortfall in Finland. Every country in the world could do with some structural reforms, some more, some less, but the big problem with most of those economies, as exemplified by the charts for the three countries above, where all are subject to the same monetary policy, is differing degrees of aggregate demand shortfall. This entry was tagged Edward Hugh, Finland, Scott Sumner, Secular Stagnation. Bookmark the permalink. Right! Every nation has structural impediments. If you put a monetary noose on a nation with structural impediments, the result is a perma-recession.